Example of magnificent transfer from movie to tv world. Does not happen offten that great movies manage to spawn equaly great tv series as that is case with Stargate SG1. In ten seasons that were recorded from 1997 till 2007 you get it all: Imagination, great humor, good science and most of all great casting. Richard Dean Anderson as Jack ONeill is first of many great performers in this show. He actually conditioned on taking this role that character he played must be much funnier than original character played by Kurt Russell. He got what he wanted and i think this humorous note that he brings is gold, pure gold. You will meet Dr. Daniel Jackson played by Michael Shanks who got this part because he did perfect imitation of James Spader from original movie, great that he did as he also gave brilliant performance. Casting also includes equaly brilliant Christopher Judge as Tealc, Amanda Tapping as Samantha Carter, Don S. Davis as George Hammond, Beau Bridges as Henry Landry, Claudia Black as Vala Mal Doran, Ben Browder as Cameron Mitchell and many many others. Entire series was made in collaboration with US Air Force. Story arcs are ranging from fate of Earth to fate of Universe. Especially imaginative are alien races: small greys named Asgard, immortal simbiots Goauld, their better cousins Tokra, nanite lifeform named Replicators, highly evolved and on other plane of existance Ancients, their badder cousins Ories to name the few. Also with great aliens comes great technology, ships, arhitecture and host of great new worlds that our heroes discover. Writters cleverly used Egyptian and Nordic mythology, also Merlin and Camelot legend to create all of this diversity and i will say it again it came out great. Especially when you take episode count of 214. into mind, series stays amazingly fresh most of the time. Spinning stargate as portal into new worlds was so great theme that this series produced not one but two movies, Arc of Truth and Continuum, also not one but two spin-off came out Stargate: Atlantis and Stargate: Universe, also animated series Stargate: Infinity. 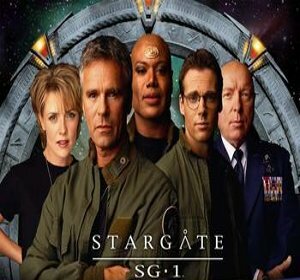 So this is show we highly recommend to every SF fan, watch in this order: original Strgate movie, than SG1 series, movies and then Atlantis. anonymous: "indeed one of greatest series of al times. and if we consider that us army had been involved in writting and consulting, as well as equipment. makes one wonder is there somenthing behind stargate program in real life world. anyway oneill is pure genious and i am hungry"
anonymous: "They dont make em like this any more. Did you know that Richard Dean Anderson was given general rank in US Army because of this show? I wonder how many other TV stars can say the same." anonymous: "same thing goes for this segment of stargate franchise. we want more stargates and less JJ Abrams in Science Fiction today."